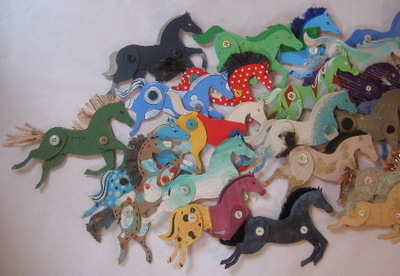 Brooklyn artist Ann Wood has posted about completing her 100 cardboard horses project. Browsing through her photos, I love that the horses are beautiful individually and as a set. (And she lives in my old stomping ground! That’s got to make her extra-special, right?). Her project also reminds me of the origami cranes we made for my friend Eri’s wedding. I’m sure there have got to be pictures somewhere… we were all origami novices (I think I was particularly ham-handed), but it was oh-so-fun to sit and work on them together. Especially lovely to see them at the ceremony.